Badminton has a long history, originating from the game of battledore and shuttlecock. A sport similar to modern badminton appeared in western India in the mid-19h Century. The British loved this sport and took it back to the UK. Due to the lack of a clear set of rules there were often disputes amongst players, that was until Bath Badminton Club completed the first badminton rule book in 1887. When the English Badminton Association was established in 1893 the rules were revised and unified and have since been the main basis for the sport. Service fault is one of the most common faults seen in badminton, so, in international competitions, as well as an umpire and six line judges, there will also be a service judge who will sit opposite the umpire and will judge if a player’s service action is in accordance with the rules. Below, we will introduce the hand signals for five commonly seen service faults. BWF rule 9.1.1 states “Neither side shall cause undue delay to the delivery of the service once the server and the receiver are ready for the service. “ After a player finishes raising their racket head backwards any delay is undue delay of serve. Also, rules 9.1.7 and 9.2 tell us that, once a player begins to swing his/her racket forward, the service is deemed to have begun and the racket must continue moving forward in a continuous motion until the serving action is completed, otherwise a fault will be called--for non-continuous movement. When undue delays occur the service judge will swing their right arm to the left to indicate that a player has been penalized for undue delay. According to rule 9.1.2, the server and the player receiving the serve should stand in the diagonally opposite service courts and must not tread on the service court boundary line. Rule 9.1.3 points out that both of the server and receiver’s feet must at least be partially touching the ground and should remain fixed in place from when the serve begins to when the action is completed. When the aforementioned breaches occur the service judge will stretch out their right leg and signal a fault with their right hand because a player’s feet were off the ground or they were on the boundary line. According to rule 9.1.4, a player’s racket face should hit the bottom of the shuttlecock. If a player fails to hit the bottom of the shuttlecock when serving, the line judge will open their right hand and lightly touch the palm with their left hand to indicate a service fault. According to rule 9.1.5, when the server’s racket hits the shuttlecock the entire racket should be below waist-height (an imaginary line across the lowest rib of a player) therefore, if the racket is too high when the serve is made, the service judge will place their right hand horizontally across their ribs. Rule 9.1.6 states that when a serve is made the racket handle must be facing down at the moment the shuttlecock is hit. If the racket handle is facing up when the shuttlecock is hit the service judge will lift up their open hand with palm facing out to indicate a fault due to the racket handle facing up. As well as the service judge there are also line judges for the back lines and side lines. 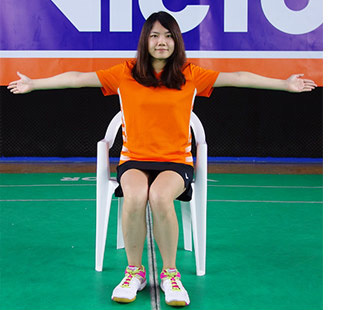 A line judge should be seated 2.5-3.5m from the line and judges whether a shuttlecock lands “in” or “out”, deciding whether a player has scored a point. If the shuttlecock lands out of bounds the line judge must loudly and quickly shout “Out” so that both players and spectators hear, and will stretch their arms out to the side level with each other while looking at the umpire with a fixed stare to ensure the umpire is clear about the decision. If the shuttlecock lands inside the line, no announcement is needed, the line judge will just point their right hand at the line. 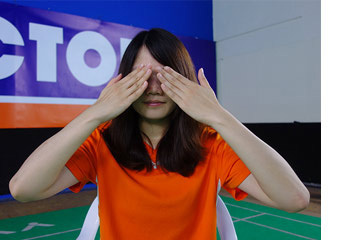 If the line judge can’t see the shuttlecock clearly (because their view is blocked by a player’s body or other unavoidable situation), as they were unable to see whether the shuttlecock landed in or out they should cover the eyes with their hands to let the umpire know. Every should spend some time becoming familiar with the commonly seen judges’ hand signal so that whether you are watching a match or playing in one you won’t have to ask “What is happening now?” “What kind of fault did the judge just signal?” and avoid other situations in which you aren’t sure what is going on!